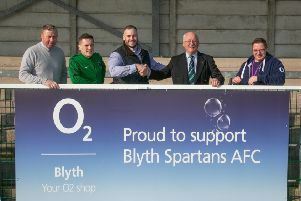 Alun Armstrong had hoped to claim all three points before Blyth Spartans’ important Evo-Stik Premier League promotion “six-pointer” against Buxton before kick-off, but he was “happy” to settle for a point given how the game turned out. Spartans had dominated much of the first half, but the momentum shifted to their Derbyshire-based visitors when Damen Mullen received his marching orders six minutes before the break – after receiving his second yellow card from referee Rebecca Welch. That setback didn’t prevent Spartans from competing in the second half and they nearly snatched a hard-fought victory, but both sides had to settle for a point at the end of a pulsating clash at Croft Park. And while Armstrong had hoped to see off Blyth’s promotion rivals prior to the start of the game, he admitted that he was glad that his side had still been able to pick up a draw in difficult circumstances. The 41-year-old admitted: “Before the game, I’d have said a draw at home would be two points dropped. However, you look at how the game panned out and – with Damo getting sent off – you’ve got to be happy with a point. “I was chuffed to bits with the lads and their work ethic – as everyone worked for each other. If I’m being honest, I think we deserved to win the game. “You wouldn’t have thought that we had ten men in that game. “It would have been an unbelievable three points if we’d ended up winning, but the most important thing was not to lose the game and they did that fantastically. While Armstrong picked out midfield maestro Stephen Turnbull for special praise for his performance on Saturday, he was also delighted with all of his players and their ability to record a clean sheet despite playing with 10 men for 50 minutes. Armstrong added: “I thought Twinny [Turnbull] was outstanding and it’s the best game I’ve seen him play since I arrived. Patta [Matty Pattison] tucked into midfield and did really well. Spartans’ chances of grabbing a win in this important league clash took a knock in the 39th minute, when Mullen was shown his second yellow card for a mis-timed tackle on Alastair Taylor. However, Armstrong thought Welch should also have reduced Buxton down to ten men as well. Armstrong added: “The biggest problem I had was that she gave out yellow cards out to our lot, but she wasn’t giving them to Buxton for the same kind of tackles. There was no difference in the tackles, but she was just speaking to them. “That’s what I was trying to get across to her, but she wasn’t listening. “Everyone could see that though, it wasn’t just me. Everyone in the ground could see that she wasn’t doing the same for both sides and, if she had, then they probably would have been down to ten men as well in the second half. After a confidence-boosting performance saw Spartans extend their unbeaten league run to nine games, Blyth now travel down to Vanarama National League North side Altrincham on Tuesday – as they set their sights on a first appearance in the Buildbase FA Trophy First Round for the first time in six years. And after being impressed with what he saw at the weekend, the Blyth boss appeared to throw down the gauntlet to his players. He revealed: “That result is a massive confidence boost for the lads – as I’ve already said to them that if we can get a clean sheet with 10 men, then why can’t we do it with 11? The winners of the tie will host Vanarama National League side Macclesfield Town on Saturday December 10 and, while he is very much focused on Altrincham, Armstrong revealed that he would love to test his players against the side from two leagues above. Armstrong said: “I watched Macclesfield in the FA Cup on TV on Friday night and it was a really good game. I’d love to put our lads up against them, but we have to get past Altrincham first. “They’re in the league above – and yes, they may be struggling – but they’re there for a reason. It’s going to be a really tough game, but the lads are really looking forward to it.